PHOTO: Scott Blackwell and Ann Marshall (with their pup, Sophie) grill local fish by their pool, then serve the fillets with peach salsa and tomato pie. Late afternoon, a motionless swelter lingers on the peninsula. A chorus of cicadas reverberates through the lush downtown courtyards. Condensation trickles down chilled coupe glasses filled with floral gin cocktails. In short, it’s July in the Holy City. For Scott Blackwell and Ann Marshall, the husband-and-wife duo behind High Wire Distilling Company, summer marks a slowdown, when locals head for more forgiving climes and workdays slip into a flexible groove. Their King Street operation still remains busy, with production for their popular watermelon brandy coming up in August and business growing in South Carolina, Georgia, Tennessee, New York, and Washington, D.C. But in the evenings, the laid-back couple returns to their Ansonborough abode for a stroll with their Lab, Sophie, and a dip in their backyard pool—which is “critical in the Charleston heat,” Ann says. Keeping with the casual air of the season, the pair’s summer meals feature fresh ingredients and unfussy preparations. “I want the flavor of whatever we’re eating to shine through, so I don’t cook things to death,” Scott notes. His go-to appetizer is a bright hummus made with fresh butter beans, garlic, tahini, lemon, and a hint of cayenne and served with pita chips and raw veggies. Another hot-weather staple? Fish bought directly from Mark Marhefka at Abundant Seafood. As members of the community-supported fishery, Scott and Ann like to spend an afternoon on Shem Creek scouting the haul and watching the fishmonger fillet his catches. Though they’re never sure what they’ll get, the pair typically opts for white, flaky choices such as vermilion snapper. 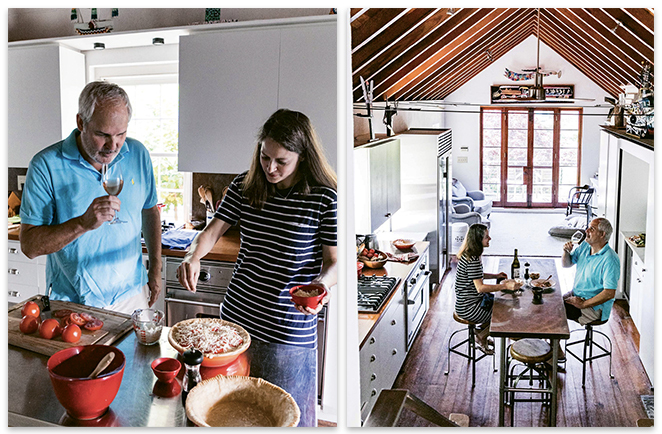 While the grill’s going, their kitchen is filled with the fragrance of tomato pie, a rich and cheesy dish bursting with red slices from John’s Island that reminds Ann of summer camp. “This recipe originally fed 800 kids at Camp Greystone, but I’ve scaled it down a bit,” she laughs. To prevent the pie from getting too watery, she liberally salts the tomatoes and allows the moisture to leech out of them. For dessert, Scott taps into his baking talents to make blueberry biscuit shortcakes topped with peaches and cream. He first freezes fresh blueberries overnight, then mixes the berries into the batter, yielding vibrant pops of color and flavor without the purple bleed from the juices. Once out of the oven, the dense, scone-like pastries are served with the stone fruit slices and soft-peaked whipped cream—a treat cool enough to stand up to the heat. Work: As the proprietors of High Wire Distilling Co.
Veg Out: “We get most excited for summer veggies,” says Scott. One of their favorites is grilled asparagus with a splash of lemon juice and sprinkle of salt and pepper.